Edina Monsoon (Saunders) and Patsy Stone (Lumley) live the high life; shopping, drinking and clubbing around London’s trendiest hotspots. Sadly, however, the PR world has changed and they are broke and out of Bolly. In desperate need of an uber client, they target Kate Moss at a fashionable launch party. Things (of course) do not go to plan. Eddie accidentally pushes the supermodel into the river Thames and the pair find themselves at the centre of a hysterical media storm. Fleeing to the glamorous playground of the super-rich, the French Riviera, Eddie and Patsy hatch a plan to return to the high life once again. What could possibly go wrong? Absolutely Fabulous: The Movie desperately wants you to have fun. The film spends its relatively short running time hurling joke after joke at its audience in the hope that at least some will land. Many do. However, many do not (some of the movie's 'fat' jokes are pretty mean). Amid all the hag gags, the drinking and the slapstick (who can resist a drunken Patsy? ), the movie features more ‘celebrity’ cameos than you can shake a Chanel lipstick at. To criticise a film with such ambitions seems churlish. After all, we are in dire need of some 'check your brain in at the door' silliness at the moment. And there is much to enjoy in Absolutely Fabulous: The Movie. Joanna Lumley is brilliant, stealing every scene. Meanwhile, in a sea of (rather throw-away) cameos Kathy Burke and Rebel Wilson shine. I would have loved to have seen more of them both. 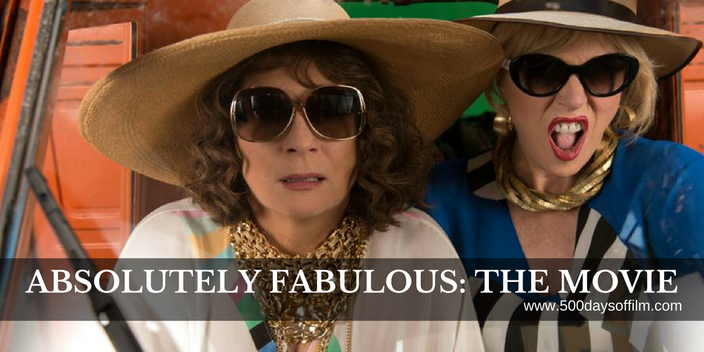 However, while director, Mandie Fletcher, and writer, Jennifer Saunders, get full marks for effort, Absolutely Fabulous: The Movie is nowhere near funny enough. Watching this film in a cinema packed full of ladies who all fancied a giggle, I was surprised by the lack of laughs. The latest installment in Eddie and Patsy's story would likely have made a hilarious 30 minute television episode. It just didn’t have the stamina necessary for a full length feature. Have you seen Absolutely Fabulous: The Movie? If so what did you think? Did you laugh all the way through? Or did it fall flat? Whatever the case, you can let me know by leaving a comment in the box below!